Home Model Trains	This little house is crammed FULL of model trains! This little house is crammed FULL of model trains! It looks like a normal house from the outside, but what you see when you step in the front door may surprise you! This fairly small 3 bedroom house is crammed full of really big model trains. Watch your step when you walk in the door, and look both ways before entering the hallway, so you don’t get run over by a train! 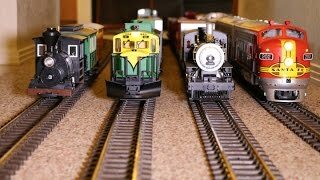 These are G-scale model trains, quite a bit larger than the more popular HO style. When you see a G-scale train held up next to an HO scale train, you might laugh!